During this time period, the average appointee was more conservative than the average careerist—as one might expect, given the president who appointed them. But there is still some variation within each group. 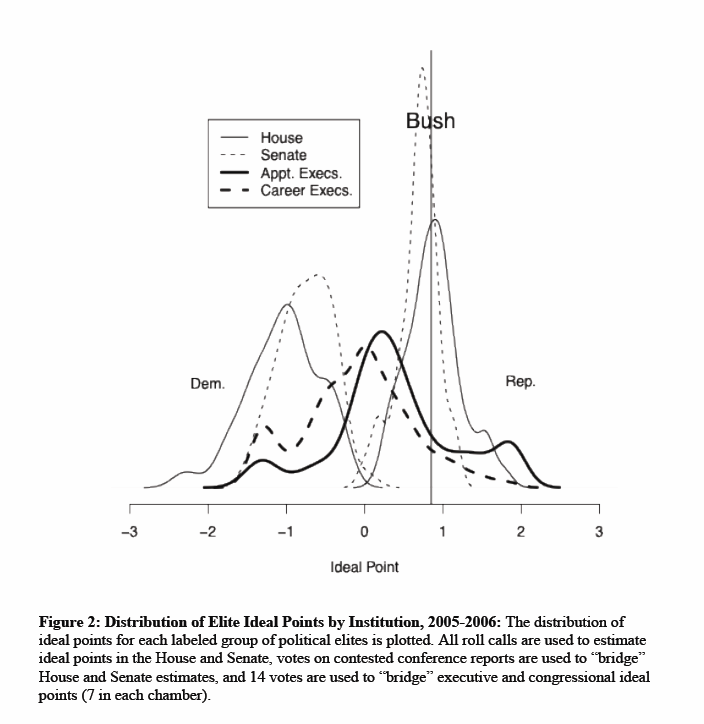 See, for example, this figure, which depicts the distributions of ideology for appointees, careerists, members of the House, and Senators (with Bush presented as a vertical line). That said, bureaucrats of both varieties are far more centrist than Democrats and Republicans in Congress and than President Bush. They then aggregate the survey responses to measure the average ideology of various federal agencies. And here’s where it gets really interesting. 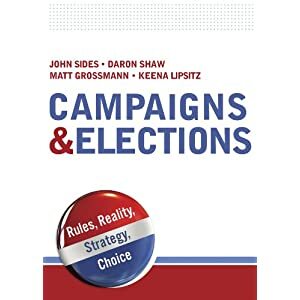 When agencies are ideologically far from the average member of Congress, the longer and more detailed are the laws that Congress passes to govern that agency. In other words, when an agency is ideologically distant from Congress, Congress appears to afford that agency less discretion, as manifest in its insistence on these detailed legal rules. The motivation for this post and the earlier one was the suggestion of a Monkey Cage reader, who suggested looking for presidential influence in places other than legislation. I think the papers discussed in both posts show some evidence of influence, in that presidential appointees will be closer to the president’s point of view than, say, career bureaucrats. But this influence should not be overstated. Not all appointees have the same views as the president. Moreover, as above finding about discretion suggests, Congress also acts to influence how bureaucrats act. So the president’s power of appointment is not the only power at work. It is always good to see presidency and bureaucratic politics begin to approach the same level of productive quantification that the legislative folks have got. That said, at least (the first half of) Neustadt is well written, which is something.